It may seem simple to put your swim cap on. After all, there’s not much to them. However, team swim caps can be much more difficult to put on correctly than they appear, especially for individuals who may have longer hair. When you follow these tips, you can easily put on the custom swim caps without taking up too much time. Custom swim caps can provide the fit you need. Lace your fingers together and place your hands inside the swim cap. Once inside the cap, part your hands and stretch out the material so it will easily fit around your head without touching it. This will help reduce any hair pulling you may experience. You don’t have to get team swimming caps in place all in one shot. While stretching it out and pulling it over your head in this position will get it mostly in the right position, you may still need to make adjustments. Tuck in any stray hairs and pull the edges carefully into place to keep your head as hydrodynamic as possible. Custom swim caps are designed to get wet, but many swimmers try to put them on while their hair and cap are both dry. This can make it more difficult. Instead, you should consider wetting down both your hair and the cap before you put your swim cap on. If you have longer hair, it can be a real challenge to get all of it into team swimming caps quickly and easily. One of the best ways is to put your hair up in a low, loose ponytail so you can easily sweep it up and under the swim cap without too much trouble. It’s important to keep your hair even when you’re putting it up in your swim cap. If you don’t evenly spread your hair throughout the swim cap, you could cause an imbalance while you’re swimming. While it won’t slow you down significantly, every fraction of a second counts when it comes to competitive swimming. If you’re looking for the best team swim caps, contact us. We carry a vast array of styles made from a number of materials so you can rest assured you get the right one to meet your needs. Are You Caring for Your Swim Gear Properly? It’s no surprise competitive swim equipment in Dallas, TX, is costly, which means it’s critical to make sure you take care of it properly to ensure you don’t have to replace it too quickly. Each piece of equipment requires careful care to keep it in good condition for longer. Not only will you save yourself money in the long run, but it will keep the gear looking great and you performing your best for as long as possible. Caring for your competitive swim equipment is essential. Once you are done swimming, rinse your custom swim caps carefully in clean water, not the pool. Once the chlorine and other chemicals have been rinsed away, carefully dry it with a soft towel. Hang the cap up to allow it to finish air drying. If you can’t do this right away, do it as soon as you get home from your practice or meet. If you will be storing the swim cap for any period of time, consider sprinkling baby powder inside. Whether you are using Speedo swimming goggles or another brand, you will need to take good care of them so they will continue to provide the protection and coverage you need without negatively impacting your visibility. Like your swim cap, you will need to rinse them thoroughly with clear, cool water. Keep them out of the sun to prevent melting. Instead, lay them flat in a cool place to dry fully. Never put them away wet if you can avoid it because this will cause mold and mildew problems, as well as break down the rubber and plastic. One of the most important pieces of competitive swim equipment you will own is your competitive swimwear. Like all your other gear, it’s essential to rinse your swimwear out once you get out of the pool and get dressed again. This will remove the chlorine and other residue that can break down the swimsuit materials. When you do wash your swimwear, wash it in cool water and preferably by hand. Lay it flat to dry because heat can damage the materials and change the way it fits. When it comes to caring for your swim gear, you can rest assured your swimming gear will last longer so you won’t have to make expensive replacements as often. This will also ensure you perform your best in the pool. If you’re looking for the best competitive swim equipment in Dallas, TX, contact us. We provide a vast array of products designed with swimmers in mind. Customizable swim gear is great for teams. Competitive swimmers need a lot of gear in order to perform their best. While most people understand purchasing their own competitive swimwear is essential, it can be just as important to buy other customizable swim gear for the entire team. When you choose to purchase swim gear customized for your team, you will create a more cohesive feel, promote a sense of team unity and help every swimmer feel proud in doing their best for the team. First and foremost, your swimmers will need competitive swimwear that will reflect your team. While non-competitive teams may allow their swimmers to select their own swimwear, both in style and color, if you’re looking for more team unity, it’s important to make sure everyone looks the same. Not only should your swimmers be wearing suits that are of a similar style and in the same color scheme, but you can also further customize them by having your team’s logo or name imprinted right on the swimsuits. Another essential piece of swim gear that is easily customized is the swim cap. Purchasing custom swim caps for your entire team will further enhance the unified look of your team, allowing everyone to quickly and easily identify the members of your team. You can purchase swim caps made from a variety of materials based on the needs of each individual swimmer and then have them imprinted with your team logo or name. In some cases, you may also want to imprint an individual swimmer’s name or an identifying number, depending on your team’s unique needs. Although not a necessity, customizing swim backpacks for your entire team can be a great incentive for your swimmers and help them stand out. Nothing says, “we’re a team” better than entering the pool area carrying similar backpacks, all dressed the same. With the vast array of swim backpacks available, you will be able to find the one that best suits the needs of your swimmers. Many of them are also available in an array of colors so you can choose a backpack that reflects your sense of team spirit. When you’re looking for the right way to give your team a boost in spirit and unity, customizable swim gear is the answer. Much of the gear and swimwear needed for competitive swimmers can be purchased in a rainbow of colors and many elements can also be customized, both for individual swimmers and for entire swim teams. The options are endless and the benefits are vast. If you’re looking for the best swim gear and competitive swimwear in Dallas, contact us. We carry everything you need to outfit your swim team with customized gear and swimsuits. Team swim caps can be made from a number of materials. One of the most overwhelming aspects of selecting the right swim gear is the swim cap. There are so many swim cap options you may not even know where to begin. Team swim caps are made from a variety of materials, many of which can be customized to best suit your needs. Understanding the purpose of each can help you make the best decision. Individuals who spend their time in the water doing water aerobics or other forms of exercise are more likely to choose Lycra swim caps because of their breathability and more comfortable fit. However, those who swim laps will still want some of the hydrodynamic effects competitive swimmers enjoy, making the tighter-fitting silicone or latex caps preferable. It may seem like swimmers would want to practice with the same custom swim caps they will race in so they have a feel for it. While this may be the case sometimes, it is often better to have a separate swim cap for practice because of the amount of time you will spend in the water. This means many swimmers purchase a low-cost swim cap they can easily replace for their practice sessions, while investing in more expensive printed swim caps for their races so they can showcase their team pride and have something they know they can rely on. Open water swimmers, on the other hand, often prefer neoprene for their swim caps because they offer a little flotation assistance and often insulate better against the colder water often encountered. Another major consideration when choosing team swim caps is how much hair each swimmer has. Female swimmers often have longer hair that needs to be tucked into a swim cap, which means choosing silicone is often the best option. This material will also reduce the amount of pulling that occurs. Silicone caps are also more snug, allowing them hold more securely. Those who have shorter hair often prefer latex. In the end, the type of custom swim caps you choose is a personal decision. Certain materials feel more comfortable for different swimmers. Allergies and other considerations may also need to be made to ensure you choose the right swim cap for the job. If you’re looking for custom printed swim caps for your team, contact us. We offer a vast selection made from a variety of materials to best suit the needs of any swimmer. Team swim caps can help you move more effectively through the water. As a competitive swimmer, you need to find as many ways as possible to improve your swim times. This means making your body as hydrodynamic as possible. For many swimmers, the addition of team swim caps can be the ideal way to hide your hair and reduce the amount of resistance you experience in the water. Custom swim caps, such as printed swim caps, can help you make a splash, as well as improve your swim times. The greatest enemy of any swimmer is resistance. There are a number of things that can create this resistance, but the hair is one of the biggest culprits. While many swimmers shave their bodies to help reduce this natural resistance, there are many who are unwilling to shave their heads as well. For these swimmers, wearing a solid silicone swim cap can be the ideal solution. These caps will smooth out the hair and eliminate any resistance that results, allowing you to swim faster without having to give up your hair when you aren’t swimming. Once you decide on using team swim caps, you will need to sort through the various options available. For many swimmers, a solid silicone swim cap can be the ideal choice for a number of reasons. Silicone caps are made from a thicker material and are thus more durable. However, this means you may lack some flexibility. Therefore, you need to make sure you are choosing one that will fit your head and is designed to cover the amount of hair you have. Failing to take these factors into account may mean your cap doesn’t fit the way it was intended. You may love your hair, but it is slowing you down in the pool. Any body hair can create more resistance in the water, increasing your swim times. Even those fractions of a second can really count when you are swimming competitively. This is why it’s important to consider custom swim caps to help hide your hair and improve your swim times. In addition, you will be able to showcase your unique sense of style in the pool. If you’re looking for the greatest selection of printed swim caps made from all materials, contact us. We can provide the swim equipment you need to help improve your swim times. The right swimming gear makes water exercise more effective. A fear of the water can make it difficult for people to exercise in the water. Because water aerobics can offer a number of benefits over other, more strenuous types of exercise, it’s important to help these individuals overcome their fears. While much of this fear is psychological, choosing the right swimming gear can help you feel more comfortable in the water and enhance the effects of your exercise routine. In addition to purchasing a swimsuit in which you can be comfortable, you should consider investing in custom swim caps. Sometimes individuals don’t want to get their hair wet or are nervous about getting water in their ears. Swim caps can be a great way to keep these two issues under control. Customizing a swim cap can be a great way to feel comfortable and look great too. Whether you always swim outdoors or just some of the time, investing in a good pair of outdoor swimming goggles keeps water out of the eyes and allows for greater visibility. For some people, it’s the fear of not being able to see well in the water that causes issues. A good pair of swim goggles is the ideal way to ensure you can see well and keeps the chlorine out of your eyes. You will feel more comfortable and will be able to focus on your exercises. Swim fins allow individuals to move more easily through the water while increasing the amount of resistance you experience. Resistance is a great asset when you’re trying to work out in the water. 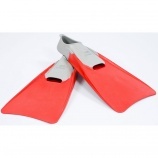 When you choose the best swim fins, you will be able to move more easily through the water and will gain a confidence you won’t develop without the help of the right swimming gear. Water aerobics can be a great way to get fit without putting a lot of stress on your joints. However, when individuals have a fear of the water, this option may not be the right one. For those who are eager to overcome their fears and start getting fit in the pool, the right swimming gear can make all of the difference. If you’re looking for the best swimming gear to make water aerobics easier, contact us. D&J Sports carries all the gear swimmers of all types need to ensure the best results. Silicone swim caps are a great option for custom caps. The summer racing season is upon us, and if you don’t already have one, now is the time for buying silicone swim caps. These custom swim caps can be created just for your swim team, whether you participate on a national team, junior national team, sectional team, tag team or any other type of swim team. Before it gets too far into the season, make sure you order team swim caps customized with your custom logos for swim teams. There are a large number of advantages to choosing silicone swim caps for your swim team experience. For swimmers who are allergic to latex, silicone is one of your best options to keep your hair dry and provide a sleek performance in the water. Because it is thicker than latex, it also does a better job of protecting the hair from chlorine and will last much longer so you don’t need to replace them as often. Silicone can also hold your custom logos for swim teams much better, giving you a great looking cap that will showcase your pride in your team. You can even use multiple colors. When you purchase custom swim caps, you get to choose exactly what they look like. Not only can you select the main color of the swim cap, but you can also design a logo or anything else you want printed on the swim cap. Swim team caps can showcase your team’s mascot, the name of your team or even your team members’ names. Some companies even offer free artwork, fast printing and no set-up or screen charges. This means you can enjoy a great custom swim cap without all the hassle many people often associate with custom products. Silicone swim caps are often the preferred method for creating custom swim caps for swim teams of all types. These caps offer a number of benefits over other swim caps, particularly those made from latex, and can be customized in more ways than others. With the right swim team company, you can order caps for the entire team so everyone matches when they hit the pool. If you’re looking for custom swim caps for your entire team and want to keep your costs low, contact us. D&J Sports offers custom silicone swim caps with no set-up fees or other charges, as well as free artwork and fast printing.